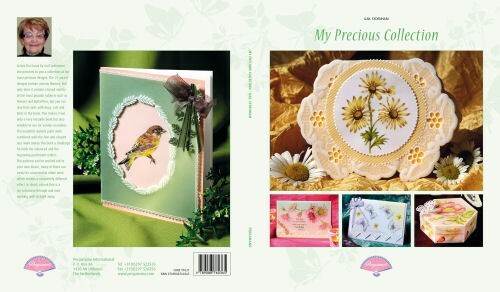 In this first book by Gail Sydenham she presents to you a collection of her most precious designs. The 21 varied designs include various themes. In this first book by Gail Sydenham she presents to you a collection of her most precious designs. The 21 varied designs include various themes. Not only does it contain a broad variety of the most popular subjects such as flowers and butterflies, but you can also find cards with dogs, cats and birds in the book. This makes it not only a very versatile book but also suitable to use for various occasions. The beautiful realistic paint work combined with the fine and elegant lace work makes this book a challenge for both the advanced and the beginning parchment crafter. The patterns can be worked out to your own desire, many of them can easily be converted to white work which creates a completely different effect. In short, a book that is a joy to browse through and start working with straight away.